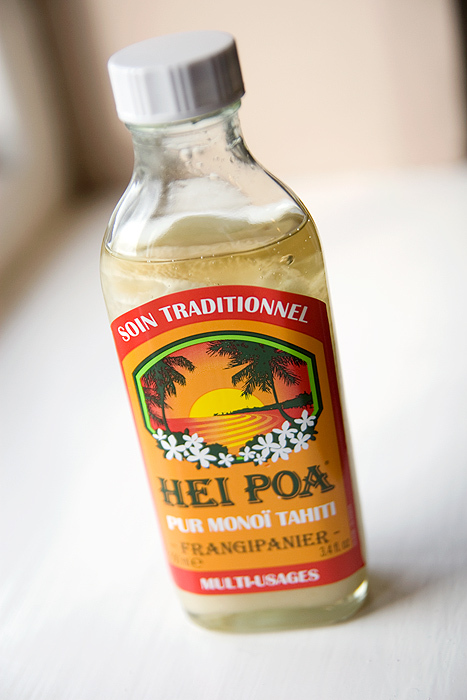 Hei Poa Pur Monoi Beauty Oil, my skin was bone dry at the time and as a fan of most body oils anyway, I was keen to try another. I ordered from Zuneta and it arrived within two days with a couple of posh samples enclosed as a bonus! It’s not particularly attractive in it’s solid state, infact… it’s not at all appetising until you unscrew the lid and give it a sniff. The unmistakable scent of Frangipani fills your nostrils, a beautiful tropical aroma. So how do you turn it from that solid, waxy-looking state into a warm oily texture ready for use on your skin or your hair? I fill a jug with hot tap water and simply sit the bottle in the water whilst I’m in the shower. 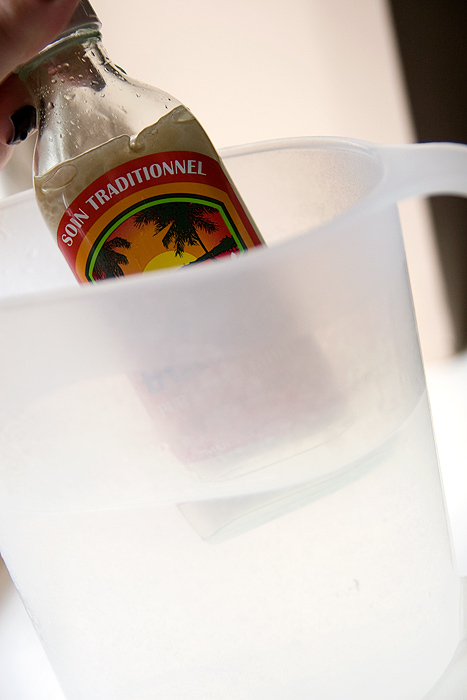 It takes about 4-5 minutes to melt completely, but you don’t need to melt the whole bottle. If you only wanted a little, you could be done in 30-40 seconds. Not a huge thing… but a point of note is that the labelling on the bottle is waterproof and has so far remained intact despite being submerged countless times! I hate paper labels on bath products that disintegrate as soon as they get a splash of water on them! After about a minute in the hot water, I pulled the bottle out and although you can see it’s not completely melted, there’s enough there for one application. 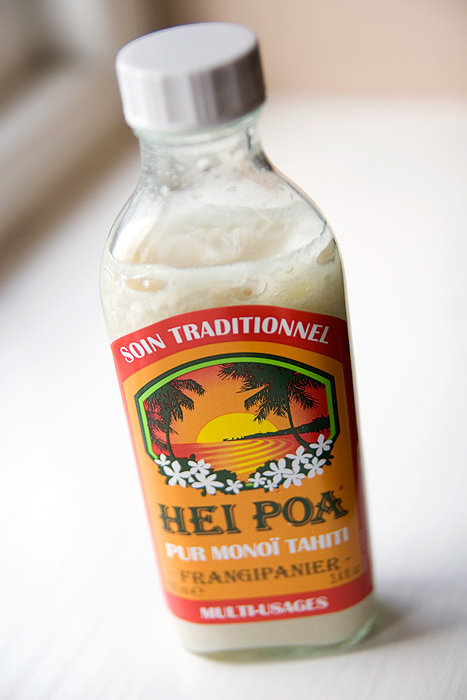 I find the Hei Poa to be a particularly dry body oil, it’s not massively ‘glidey’ and once I’ve started to spread, it drags a touch on my skin. The flip-side to that is that I’m not left feeling at all greasy. It’s a trade off that I’m happy with. The oil leaves my skin feeling noticeably smoother with a beautiful sheen and delicate scent. I’m a very happy Hei Poa convert! What to try next? The ‘golden glow’ version or the shower/bath oil? – decisions, decisions! Love this stuff. I think it’s a pretty reasonable price too, particularly compared with the Elemis and NARS interpretations. Ima tell you a recipe that my momma uses to make me a nice, moisturizing scrub: just some olive oil and sugar! You’ve probably heard of this before. The olive oil doesn’t leave a greasy feeling on your face though, it only leaves a kind of, soft feeling. I don’t know how to describe it. But it does the job that a scrub is supposed to do, especially in this winter time. This sounds really good! I don’t like body oils because of their tendancies to be greasy, but this sounds pretty good. I love anything tropical scented! Try the shower oil next 😉 I love my l’occitane shower oil..definitely a wonder product. I would be interested to see how this works. I’ve never even heard of this before! It looks so weird….good, but weird. 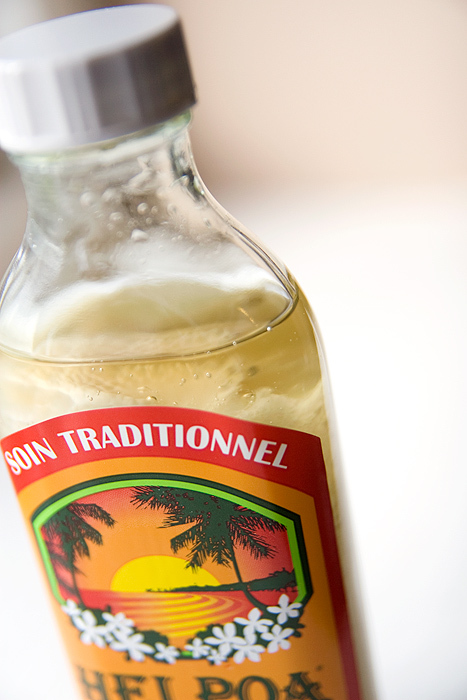 I picked up a bottle of Monoi Oil in a French supermarket and I’ve recently been using it post-shower. I have to say that mine isn’t ‘dry’ and takes a while to sink in, but the results are fabulous. My skin feels a lot softer and smells gorgeous. Can’t wait to try it on my hair now.